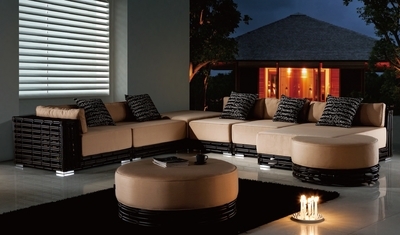 Our fresh contemporary All Weather Wicker Pomellato Collection boasts sophistication without stuffiness. With its modern burgeoning motif, this upscale collection can sit pretty in a formal environment, while at the same time, this sectional set is irresistibly comfortable with it's airy frame woven with Viro resin, high density Sunbrella� Canvas Camel fabric cushions and throw pillows, promoting absolute relaxation. This is one of our most prized 2012 Collections and should be for years to come. It will bring elegance and style to any outdoor patio furniture space. This set uses aluminum frame, PE tubing and Prussian Bronze Viro� resin. At Open Air Lifestyles, LLC, we believe that just as great design is the heart of all fine furnishings; exceptional quality must be the soul of all outdoor patio furniture. Alluring comfort and exquisite style infuse everything we do - creating great collections, hand-crafted one item at a time, to quality standards that are some of the highest in the industry. Open Air Lifestyles, LLC outdoor patio furniture fulfills many outdoor applications including commercial or residential, and complements many different architectural designs, and offers a wide variety of styles that fit any and all outdoor living spaces. Every piece of Open Air Lifestyles, LLC outdoor patio furniture expresses a rare sense of belonging with careful attention to scale, proportion and detail. The results are timeless designs that gratify today and delight tomorrow. Open Air Lifestyles, LLC design department works tirelessly to develop new wicker patio furniture, cast aluminum patio furniture, aluminum sling patio furniture and teak patio furniture to grace the industry each and every year. Created by Open Air's own design team, every piece of Open Air's aluminum, wicker or teak outdoor patio furniture celebrates an unmistakable spirit of style, comfort, and quality that is unique to Open Air Lifestyles, LLC. We're here to help you 7 days a week. If you have any questions about our Patio Furniture, about ordering on our website, or questions about any collection, please do not hesitate to call us today TOLL FREE at 1-877-548-5697.